The Himalayas are a prime example of how tectonic plate motion can manipulate the earth in extraordinary ways. These colliding plates resulted in the formation of the highest mountain range on the planet. Our continents are carried by a series of tectonic plates located in the earth’s lithosphere. These plates collide with and separate from each other at different rates determined by a process known as convection. Directly below the lithosphere is the inner mantle known as the aesthenosphere. Convection currents are generated in the earth’s inner mantle as molten rock forms from the radioactive decay of elements. As hot gas and liquid is produced it moves upward, displacing the cooler and denser gas and liquid. As this convection process happens, those circulations push the lithosphere’s plates (and the seven continents that sit on top of them), slowly shifting the globe’s landscape over time. The direction and rate of movement is totally dependent on what kinds of convection currents are at work below. Once, all the world’s landmass was connected, forming one super-continent known as Pangea. Approximately 200 million years ago, tectonic forces broke apart this giant continent into pieces, eventually forming the continents we know today. As convection currents worked independently on the plates associated with these new continental pieces, the plates and their respective continents began to drift across the globe to their present-day geographical locations. Eighty million years ago, India was approximately 6400 km (3968 miles) south of the Eurasian plate. Separating the two was the Tethys Sea. The Indo-Australian tectonic plate – containing the continent of Australia, the Indian subcontinent, and surrounding ocean – was pushed northward by the convection currents generated in the inner mantle. For millions of years, India made its way across the sea toward the Eurasian plate. As India approached Asia, around 40 million years ago, the Tethys Sea began to shrink and its seabed slowly pushed upwards. The Tethys Sea disappeared completely around 20 million years ago and sediments rising from its seabed formed a mountain range. When India and Tibet collided, instead of descending with the plate, the relatively light sedimentary and metamorphic rock that makes up the subcontinent of India pushed against Tibet, forcing it upwards, and created a massive mountain fold. The Himalayas. This process hasn’t stopped. The Indo-Australian plate is still moving toward Eurasia, still pushing Tibet upwards. 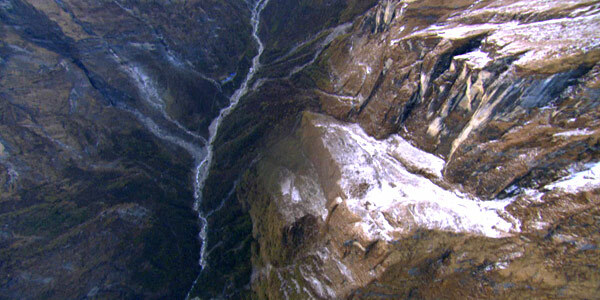 The Himalayas continue to rise by an average of 2 cm each year. The highest mountains are only getting higher.